Mobile surveys & Customer feedback. Improve engagement and performance by collecting instant, valuable feedback. The next generation in collecting feedback. Effective SMS & Mobile solutions that improve the way you collect and process feedback. Finding the perfect method to capture data requires some consideration of what you want to find out and who you are talking to.There are no limitations when it comes to mobile messaging surveys, your questions aren’t limited to simple answers. Send out branched or linear surveys through SMS and Mobile forms or encourage deeper with Voice Surveys. Integrate your existing CRM and business applications with our API to automatically send out surveys without the need for manual upload. Create triggers that will automatically send a survey after your customers have completed an action and collect customer feedback at the freshest point of interaction. Completion rate for the average online form is only 12.57% and is even lower on mobile as forms are not optimised for smaller screen sizes or aren’t mobile friendly. By sending a link within an email or SMS to an Esendex Mobile Journey, you can remove the distractions and difficulties associated with collecting feedback by delivering a dedicated survey journey to a recipient while on-the-go. Reactions and perceptions can change very quickly in customer service. Our Mobile Forms & survey solutions can pass data over to a member of your team, or department by email or trigger within your API as little or often as you prefer. Our visual reporting dashboard for SMS Surveys even quicker, processing data in real-time. "SMS Surveys have allowed us to engage with our customers in a modern and less obtrusive medium while increasing response rates from 3% to 27%. Great value for money." Successful businesses understand the requirements and needs of their customers and staff. Traditionally, understanding these needs has long been the domain of large and expansive applications or paperwork. At Esendex we pride ourselves on the provision of the best tools that enable your business to collect the valuable insight needed to measure satisfaction and wellbeing. 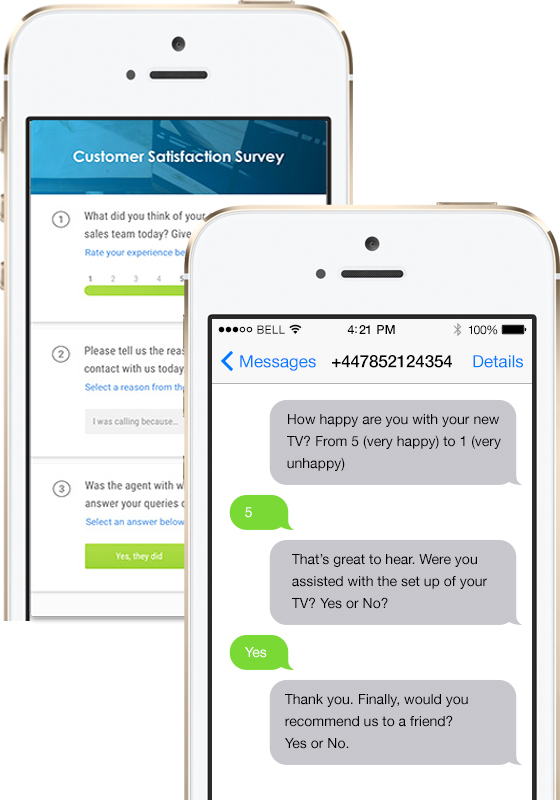 Our secure and interactive SMS Surveys, Voice & Mobile Form solutions can help you turn reviews into revenue, tracking improvements and improving performance. Create meaningful conversations that remove the barriers between management, customers and staff by delivering the questions you want to ask to produce the responses your business depends on. Show customers and staff that their opinions matter by inviting and acting upon their survey feedback. Make positive changes that build loyal relationships that last for many years to come and benefit from great open and response rates which are 4x better than email. "70% of the customer's experience is based upon how they feel they are being treated"
95.3% of respondents said they would respond to an SMS Survey request. 70% of customers will do business with you again if you resolve their complaints. 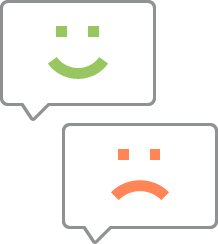 Companies that regularly collect employee feedback have 15% lower turnover rates.